Dr. Peter Fadde applies sports science to batting drills focusing on pitch recognition. He’s a Professor in Learning Systems Design & Technology at Southern Illinois University. CLICK HERE for a great case study featured in the Baseball Collegiate Newspaper titled, “Pitch Recognition Can Be Done By Hitters”, where Dr. Peter Fadde was asked to consult with Southeast Missouri State hitting coach Dillon Lawson on the subject of pitch recognition with his hitters, in March of 2014. I heard about Dr. Peter Fadde through a few of my readers who saw him speak at the 2015 ABCA conference (ABCA “Doing Damage at the Plate by Training Pitch Recognition” video above). Since, I’ve read his ebook “The 6th Tool: Training Baseball Pitch Recognition” in less than an hour, corresponded with him via email, and felt it a MUST to put together an interview with him sharing his insights with you. By the way, the pitch recognition hitting drills that Dr. Peter Fadde proposes in The 6th Tool book link above, work well with both baseball and softball hitters at ALL levels, not just at the collegiate and pro levels. Also, Dr. Peter Fadde is one of the experts in the area of vision, tracking, and timing that has contributed videos to the Reaction Time Mastery online video course. What are some great drills to practice vision/tracking? What I focus on for Pitch Recognition (PR) is separate from vision skills (peripheral vision, dynamic tracking acuity) and tracking. Sports science calls it a “perceptual-cognitive” skill, meaning that it is vision-based but a mental skill. It’s picking up cues in the pitcher’s wind-up, release, and the first 10-20 feet of ball flight. By picking up advance cues, expert hitters anticipate pitch movement earlier. The best drill for practicing PR is Bullpen Stand-In Drill. Batters have been standing in forever. The difference here is the batter needs to call out loud “Yes” or “No” BEFORE THE BALL HITS THE CATCHER’S MITT. That’s what turns it from passive tracking to PR practice. You need to recognize the pitch right out of the pitcher’s hand to get your call made in time. “Yes” can stand for a pitch type (usually Fastball), or for FB in Zone, or Strike, or Swing Ahead in Count — whatever a coach or hitter wants to work on. Call LOUD so that it is good feedback for pitchers. Bullpen Stand-In Drill is one of six PR drills shown in the “The 6th Tool ” eBook. How do you teach kids to pick up the seams and stay balanced on off-speed pitches? Kids should practice calling breaking pitches out of the pitcher’s hand, so that they recognize that most curve balls need to “pop up” out of the pitcher’s hand in order to come down in the strike zone. Their eyes and natural tracking want to give up on that pitch. Learning to see it early and plan to attack it should keep mechanics sound. How do you use vision drills for high school hitters? 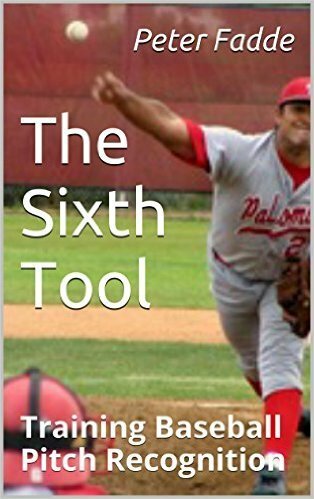 A high school hitter can learn the PR drills in the “Sixth Tool “ eBook and then teach a parent or coach as a hitting facility for one-on-one drills. I also have several occlusion videos of High School and College pitchers that are available to coaches or players who get the eBook and email me. How can I get my players to recognize which curveball is the right one to hit and which one to take? Wade Boggs said he could feel his eyes bob up in his head for the hanging curveball. Every batter can use his own clues. The point is to TRAIN yourself not to give up on that pitch. Few high school pitchers can throw a tight enough curveball to have it come out flat and not drop below the strike zone. Learn to jump on that pop up curve rather than giving up on it. What’s an easy way to explain the concept of vision,tracking, timing a pitch? Without trying to make things more difficult, I am adding PR as another dimension to Vision and Tracking. The good news is that a batter can get better by improving any or all of the three. A good program includes all three. What keys does a batter use for tracking the ball prior to the pitch and on the release? Especially at high school level or lower, pitchers often give pre-release cues. I don’t mean pitch tipping things, like glove position. More like learning to “feel” the pitcher muscling up for his fastball, or throwing up hill for a curve. At release, some batters pick up “skinny wrist” for curveball. Some batters pickup more white or less thrust out of the pitcher’s hand for changeup. How can I concentrate better and see “the ball hit the bat”? Concentrate on seeing the pitcher’s motion and release. These aren’t natural and so need direct practice. Tracking to (or near) contact is natural so needs less direct practice. Good PR approach and sound mechanics should generate plenty of good contact. Joey, for those that don’t know or understand, this is a real game changer. I’m super interested in the occlusion video training. That and the bullpen sessions can make real differences in hitters being able determine type, location, ball and strike… The video stuff is the real key bc the hitters can do that on their own. Major game changer. This stuff is super simple to infuse into practices. Just have to make the decision to get started and get the hands dirty with the drills. The best part is, all these drills are validated by science, and tested by professional and college teams to work in the ‘real world’. Thanks for sharing Djura. Firstly, you have to get those kids used to getting hit with whiffles, racquetballs, tennis balls, etc. Teach them to get hit using the ‘turning in towards the catcher’ technique, and when they get used to the motion, then throw to them mixing in strikes and balls at them. Once they get over fear of getting hit, train them on Dr. Peter Fadde’s techniques, even if just have them sit down and watching occlusion video of pitchers’ release points. Lots of simple drills to use with younger hitters, just keep it to 1 or 2 of them, and as they get older, add more. I would be interested in knowing what cues they are using to recognize each type of pitch. To Sully question about cues to look for. Batters see different things, so don’t like to be too specific. Some batters pick up skinny wrist for Curve, or sense pitcher is throwing CB uphill. Or get feel for pitcher “muscling up” for fastball. Or pickup less thrust of ball out of pitcher’s hand on change. But mostly it’s repetition with immediate feedback and let their eyes figure it out. Hey Joey, I’m curious, how much did the players involved struggle or feel frustrated when going through this process? Was it similar to massed vs non-massed practice? Ryan, the pitch recognition training detailed in Dr. Peter Fadde’s book is very frustrating at first. Because most hitters aren’t used to picking up pitch cues this early. But everything new is frustrating. The more reps the hitter takes in these drills, the better and less frustrated they’ll get. Softball Hitting Tips For Kids: Why Late Head Movement Fails & Early Head... Fastpitch Softball Hitting Mechanics: Different Than Baseball? How?